When you’re in charge, it ain’t easy. It doesn’t matter if you’re the breadwinner, the decision maker, the manager, the side-hustle shaker, or the CEO…when everything ladders up to you and only you, it can feel isolating. And even lonely. I feel like this more times than I can count throughout any given week. Some days I’ll be high on life, knowing that the freedom to run a business and have impact is a special kind of heaven. And occasionally when I focus too much on my doubt, or on the realization that there is no safety net, no one to count on but myself to make this all work, it can feel like a special kind of hell. One thing that always brings me back to center is being around groups of humans who are in the hustle with me. 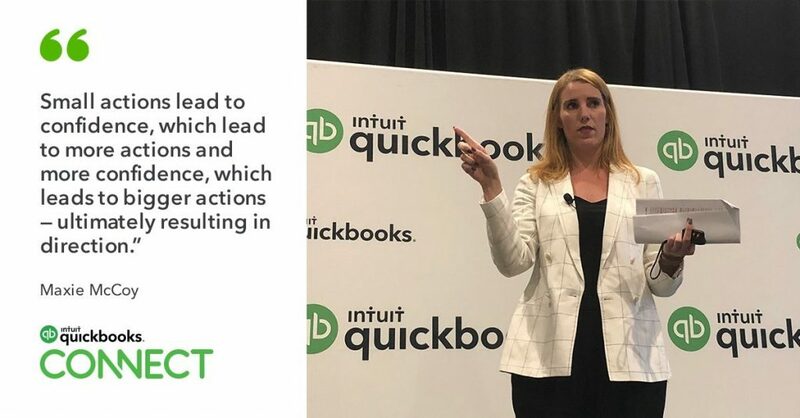 I had the opportunity to lead a few sessions at Intuit’s Quickbooks Connect and shoot did it make me feel alive – to be around so many people like myself all just trying to figure out how to run our own thing (and let’s be real…get out of our own way). On Failure… “It’s only a “failure” if you don’t learn from your mistake. Otherwise, it’s just a mistake.” Mindy Kaling passed along this advice that she was given by Queen Oprah. And I was sitting in the back of that dark room saying A(wo)MEN. We’re all making mistakes on the regular. As we should be, it means we’re trying new things. But it’s not a giant failure unless we choose not to learn from it. It’s why reflection is such a powerful thing. Making time to journal, to reflect, to look at our past choices, gives us so much information for how to move onward. On Self Care… “Figure out what works for you.” While I led a panel on how to take care of your #1 (you! ), it was abundantly clear that there’s no ‘one size fits all’ self-care strategy. We have to figure out what works for us, both in identifying what matters most, to how we want to handle our digital devices, to how to set and uphold boundaries. But figuring out what energizes us and what drains us is an easy way to figure out what’s working and what is not. On Feeling Lost… “What’s the absolute smallest thing you can do today?” As creators and visionaries and future thinkers, it can be hard to think small. But I implored my breakout group to do just that. The smaller we can think, the more we can act. And eventually it will all lead to exactly where we never even knew we wanted to be. On Knowing What to do (or Not Do)… “Share your problems to receive your solutions.” We aren’t successful alone. And as I sat catching up with one of my favorite peers and fellow business owners, I realized we can instantly feel inspired and less alone by having real-talk conversations with those in the same hustle. It’s empowering. It’s energizing. And it gives us really good perspective and solutions. No matter what it is you’re running: your team, your business, your self, your side-hustle, your department…know that you’re doing it. Keep going, keep believing in yourself, and finding magic in the moments right now. It’ll all eventually build to where you want to be if you’re taking the small steps.